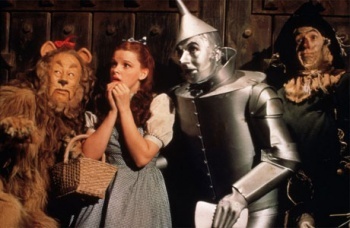 In a move that's sure to bother no-one, Warner Bros. is planning to remake The Wizard of Oz from the original script. In a cinematic landscape filled with remakes, reboots, and reimaginings, it seems as though nothing is new. Warner Bros. intends to take things one step further, and remake the classic 1939 film The Wizard of Oz using the original script. Deadline notes that "Warner Bros owns the screenplay because Ted Turner bought it along with the MGM library before Warner Bros bought Turner's empire," so we should maybe expect this to happen. Back to the Future director Robert Zemeckis is attached to the project, which seems oddly appropriate. Zemeckis has been recently encamped in the uncanny valley, working on holiday-themed action-capture animation (The Polar Express, A Christmas Carol), so it's nice to see him poking his head out to work with humans again. This is apparently not the only Wizard of Oz-based film in the works. A feature-film adaptation of the 2003 Broadway musical Wicked has been kicked around for years. Disney is looking to land Robert Downey, Jr. (Iron Man, Sherlock Holmes) to star in Oz: The Great and Powerful, presumably a tale about the wizard himself. Sam Raimi (Drag Me To Hell, Spider-Man) is "developing" that project, which could mean writing, directing, or producing, as he's known for all three. Robert Zemeckis's representatives released a statement today to Entertainment Weekly insisting "The reports that Robert Zemeckis is doing The Wizard of Oz are absolutely false." It's unclear whether this denial is a reaction to the internet exploding over his being attached to direct.